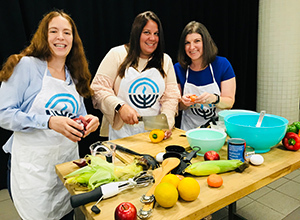 Young women from all across Jewish South Palm Beach County will be teaming up to turn baskets of mystery ingredients and cooking tools in the first-ever Incr”Edible” CHOPPED Competition on April 10, 2018. Before enthusiastic spectators, they’ll compete in a fast-paced battle to WOW the team of “celebrity” judges in Zinman Hall at the Jewish Federation of South Palm Beach County. The evening will begin with registration at 7:15 p.m., moving on to the program at 7:30. Guests will enjoy dinner, desserts and wine, with dietary laws observed. In lieu of a couvert, participants and spectators are asked to contribute $118 to the 2018 UJA/Jewish Federation of South Palm Beach County Annual Campaign to build a stronger Jewish community locally, in Israel and around the world. Guests are also encouraged to show their support for community members in need by bringing non-perishable items such as canned tuna, jars of peanut butter, pasta and toiletries for recipients of the Jacobson Family Food Pantry at JFS. Registration for the Incr”Edible”CHOPPED Competition is available online at jewishboca.org/chopped. For more information, call 561.852.5015 or email lianak@bocafed.org. The Jewish Federation of South Palm Beach’s Young Women’s Initiative is a group of like-minded women who are passionate about both making a difference and enjoying time with friends old and new. For more information, call 561.852.5015 or email lianak@bocafed.org.